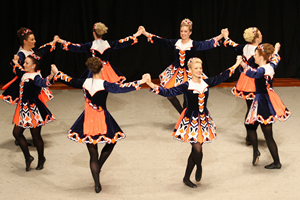 The five types of Irish music and associated dances are the reel, slip jig, hornpipe, jig, and the set dances. Just as dresses are evolving so are dances. Some innovations are more controversial because they conflict with keeping true to traditions. However, highly skilled dancers are always pushing the boundaries. This is a soft shoe dance. 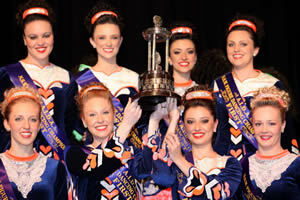 The reel originated in Scotland around 1750 and the Irish dance masters brought it to full development. The music is 4/4 time and it is danced at a relatively fast tempo. Both men and women dance the reel. For women, it is a light, rapid, soft shoe dance that allows for plenty of leaping and demands an energetic performance from the dancer. Men often dance the reel in hard shoes without tips. Slip jigs are danced in 9/8 time. They are also danced in soft shoes. It has a really soft and floating quality to the dance and it is a ladies dance. It is avery graceful dance with light hopping and skipping. Boys over 12 do not dance slip jigs. Jigs are danced in 6/8 time. It is a hard shoe dance but beginners start in soft shoes. Beginners learn "Hop and Hop" as their first jig in soft shoes; it is also called a light jig. Another beginner jig is the single jig, which has the same tempo as the song "pop goes the weasel." In your first competition you will enter the Extra Jig. This is the same dance as the light jig, but if you've curled and dressed you should get to dance twice even if it is the same dance. 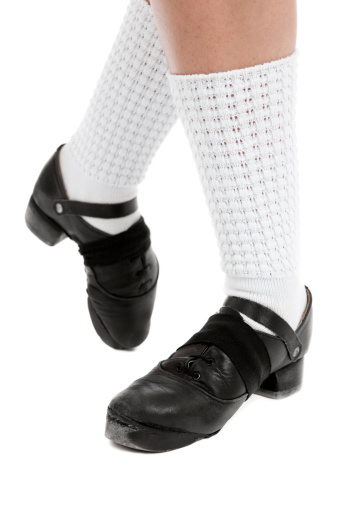 Later when they get their hard shoes they will learn the treble jig which has a slower tempo, but dancers triple the beats with their hard shoes. The hornpipe began around 1760, it was originally danced exclusively by males in hard shoes and the first girls who tried it were considered quite bold. But now both men and women compete. The hornpipe is in 2/4 or 4/4 time. A notable feature is the frequent use of rocking of the ankles. Your child will start to learn the Hornpipe when she is nine years old (Minors). A set dance is performed to a specific tune which has remained set over time. They are Hard shoe dances. There are many set dances which come from an approved list. The unusual titles of these tunes are very old, some even referring to Napoleon’s battles or just daily life, like "Kilkenny races" . The first set dances your child will learn are "St. Patrick’s Day" and then "The Blackbird". These are traditional set dances which means the steps don't change. There are non-traditional set dances which can have some individual choreography. Non Traditional Set Dances are chosen by the teacher for the dancer. They are either in Jig time or Hornpipe time. For the set dance you have to dance opposite time to the hard shoe dance. (if your hardshoe is a jig then your set must be a hornpipe time set). They are longer than the hardshoe dance and some of them are quite long and they are usually only done by stronger,older dancers. Planxty Davis and Kilkenny Races are long. They can be made ever longer still by the speed of the music. In competition the speed is announced to the musician and he will adjust his metronome to suit. A dance at 76 beats per minute goes on a lot longer than the same dance at 101 beats per minute. Team or Ceili dances date back a long way but were standardised by the Handbook of Irish Dances which was published in 1902. The hands are used in team dances which a more like folk dances than the solo dances. They can be all girl or mixed teams of 3, 4, 6 or 8 dancers. The girls wear matching team dresses which are owned by each studio. Not all competitions have a team section. Team dances are learnt in an additional teams class. The dancers compete in age groups. Under 10 Under 12, Under 15, Under 18, & Open Age. While there are 30 dances, a child will only learn a fraction of these. The easier dances are danced by the under 10s and the Open Age Dancers are expected to tackle the harder ones. They are chosen by the teacher.